Launched today following months of intelligent engineering and in collaboration with three world-leading audio companies to create a flawless vinyl replay system that’s been perfected to exacting standards. 10th May 2018 – Steyning, England – SME, the British engineering and specialist high end audio company, is proud to announce the launch of Synergy, a precision-engineered integrated turntable featuring magnesium tonearm, moving coil cartridge and built-in phono stage. 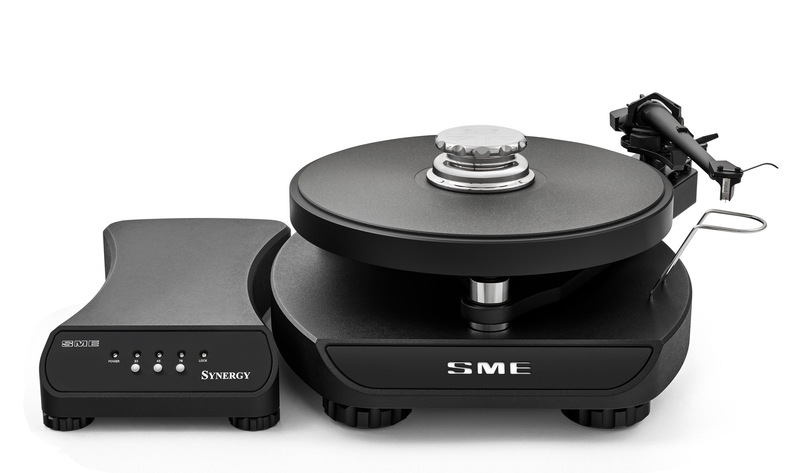 Based on over 70 years of precision engineering and audio experience, Synergy represents the first time that SME has offered an integrated turntable solution for its customers. Comprising of a completely new turntable design combined with the highly acclaimed SME Series IV tonearm, Ortofon’s ‘exclusive series’ MC Windfeld Ti cartridge and a specially designed phono stage by NAGRA, all coupled with mono crystal silver wire by Crystal Cable, Synergy is a fully integrated turntable unit that is factory configured requiring minimal user set-up.